Organizations are suffering painful adjustments as they react to the latest disruptive challenges which bring new and different problems to solve. The author believes we must expect constant disruptions and in some unexpected spheres, that we can’t look to the past for future solutions and that strategic planning as we know it, is no longer workable. Bob Shafto explains the art of adaptive leadership and makes clear the importance of rethinking traditional business models to create a more adaptive, future-focused approach in today’s fast-paced, ever-changing world. 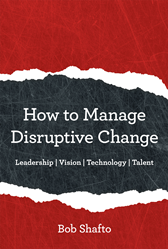 Accelerating change makes the future less knowable and impossible to plan for, which is why “How to Manage Disruptive Change” demonstrates how organizations can be flexible, resilient, and innovative. The book teaches progressive realization, where organizations welcome diversity of minds, are more horizontal and team-based, as opposed to a top-down approach to discovering the future. “The premise of the book is that through the symmetry of leadership, vision, technology, and talent, organizations can become an adaptive enterprise. The book offers innovative ideas, concepts, and principles for organizational debate, discussion, learning, and decision-making.” -said Shafto. Readers will learn actionable skills for adapting to and succeeding amidst disruptive and frequent change. Bob Shafto earned a bachelor’s degree in actuarial science from Drake University. He managed computer systems for Guarantee Mutual, was a senior-systems engineer at Electronic Data Systems Corp. He joined New England Mutual Life as vice president and chief information officer. After a series of promotions, Mr. Shafto was appointed to Chairman of the Board and Chief Executive Officer (CEO). Mr. Shafto has more than thirty-five years of computer systems development, project, and executive management experience. To learn more, please visit http://www.howtomanagedisruptivechange.com.